This is the time of the school year where I feel the most compassion for our educators and students, as they begin taking the series of tests that will be used to identify and classify them in the eyes of our current educational systems. I’ve watched countless students and teachers plow their way through state standardized testing—and I’ve seen the faces of anxiety-ridden students who feel like their self-worth is on the line when it comes to these tests. These testing weeks, and even the whole school year, can lead to a pressure cooker-like atmosphere, in which teachers feel tremendous pressure to “teach to the test” because their own accountability is on the line, as well as state funding levels for their schools. Is the test worth it? Here’s my opinion: The test helps with understanding SOME of the skills that are important for our students to have learned. It measures a student’s ability to do rationalist forms of thinking and convey ideas in words and mathematical expressions. And it sometimes measures how well a student can read and understand information. While I believe it is important to measure students’ progress towards the mastery of subject material and standards, I also believe we are missing the boat if we are only measuring left-brained skills. There are so many other crucial skills that our students need to be given credit for that are not measured by the standardized tests, but are equally important. Standardized tests don’t measure creativity, imagination, the capability to see possibility and multiple solutions to problems. They don’t measure compassion, understanding, and the capacity to empathize and console. They don’t measure a student’s ability to be a magician, songwriter, engineer, inventor, designer, artist, musician, innovator, risk-taker, or big picture thinker. I believe these skills are just as important as learning how to read, write, and do math. And you know what else I believe? That a one-size-fits-all approach to education leaves many students behind and falling through the cracks. It leaves them feeling as if they are not enough. And this makes me incredibly sad because they are enough, and they have unique gifts to contribute to our world. Everyone should feel valued for the skills they have—and the ones they are still developing. They should be given the chance to find out how they’ll contribute to the world in a meaningful way. As educators, we know that placing outsized value on IQ and the ability to perform and learn in only a few, distinct ways is an outdated practice. We know not to associate these skills with a person’s intrinsic value and worth. We know that there are all kinds of skills and abilities students have, and it’s our job to help them build their own stamina on skills that don’t come as naturally to them. BUT it’s also about finding the skills and abilities that are unique to each student and teaching them how they can use them to be successful. We need to teach them success comes in all different shapes and sizes. As educators, we’ve all had the experience of information not getting through to a student—UNTIL we’ve realized we just have to present it in a different way. There are all kinds of different intelligences out there that are unique to the individual. I see now more than ever that teachers, administrators, and most of us in the education field are on a mission to reimagine what our students are capable of doing. We know we are not intrinsically defined by this test, even if outside influences want to tell us we are. And we also know that our students and their self-worth are not on the line with this test. But it’s up to us to communicate the message to our students, our parents, and our community. So this week, yes, we are encouraging our students to do their best. 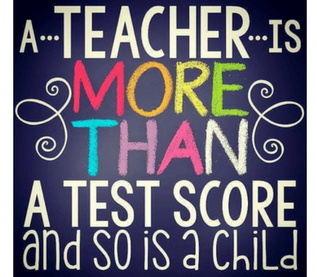 But everyone needs to remind them that they are so much more than this test and so is their teacher.